I began playing poker tournaments in Santa Cruz the mid-1980s. Since this was before flop games came to California, there were three single-draw options: Ace-to-Five Lowball, High-Low Draw, and Five Card Draw High only. I had a lot of success in Lowball tournaments over the years, winning the first California State Lowball Championship in 1993 and making ten other final tables in the 1990s till the game finally died a merciful death. And, my High-Low Draw experience served me well in helping me develop the strategies for my most successful game, Omaha High-Low Split. While Five Card Draw was the game depicted often in movies and played most on kitchen tables, it was much less popular than Ace-to-Five Lowball in California's cardrooms for one simple reason: the skill level is far higher in Draw High. Lowball was invented for some of the same reasons that Texas Hold'em was... both games have much more random short term luck than Five Card Draw High and 5-Card/7-Card Stud variations. It's easier for poor players to get lucky, for a short time at least, playing bad hands in Lowball and Hold'em. When the Santa Cruz cardroom began offering tournaments they would alternate each week between Draw High and Lowball... even though Draw High was not offered as a ring game at the cardroom (Draw High-Low was). For several months, myself and another player, HurryBack John, would alternate winning the Draw High tournaments, largely because most of the 25 or so players who would enter simply could not come to grips with the strategy and tactics needed to win at the end of the tournament when blinds were very high and King-high no-pair would often be not only the winning hand, but a reasonable hand to draw to (like drawing three to KQ or KJ). HurryBack and I consistently winning the Draw tournaments inevitably lead to the Draw fields getting smaller than the Lowball ones, until finally the club owner ended the Draw events, replacing High Only with more Lowball and occasional High Low events. 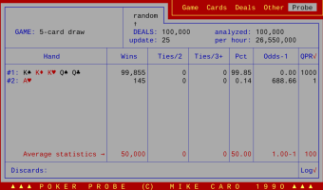 Anyway, considering my win rate in the game, after I started playing the Southern California tournament circuit in 1993, I was always disappointed no one ever spread a Five Card Draw High event. That is... except for one glorious day in 1996. To commemorate Mike Caro's 52nd birthday, Hollywood Park Casino offered the only Five Card Draw (Single Draw) tournament in the past 25 years, that I know of. As I recall there were about 75 players, for a $220 entry, but since there is no Hendon Mob record of the event (the Mob site doesn't include quite a lot of tournaments of this era and before) I can't be sure of the details. What I do remember is I was as excited about this tournament as any I ever played -- even though I had not played a single hand of Draw High in a decade. There were two notable things about this event that stuck with me over the years, and served as very valuable lessons for the rest of my tournament playing. The first one involves a smug (though quietly so) player at my first table. The structure of the event was a dealer button rotated around the table each hand as normal, but instead of blinds, every player anteed each hand. After the deal, the first player to the left of the button could open or fold. (If a one chip ante, the open would be two chips, meaning the open was cheap compared to the size of the antes in the pot.) 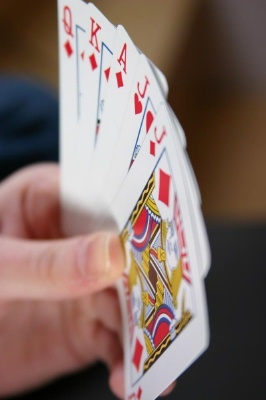 If no one chose to open, the player in the dealer position would win the antes and we would move on to the next hand. I was in seat 6 while Mr. Smug was in Seat 2. For the first three rounds of the tournament, he played exactly zero hands... meaning he was losing 24 chips without playing a hand. Finally he opens under the gun. I thought "wow, that smug dude who hasn't played a hand finally plays his first hand, and it is under the gun... has to be a monster." The player to his left calls, everybody else folds. Mr. Smug draws one, opponent draws three. Then, Mr. Smug checks, and I think: "OMG, did he actually wait three rounds just to draw to a flush???" After he checks, his opponent makes three of a kind and cluelessly bets... and Mr. Smug smugly raises! The opponent calls, and Mr. Smug smugly turns over his KQ543 flush. Opponent shows his three sevens -- meaning he called the open of a man who had not played any of the previous 24 hands... with a pair of sevens! Mr. Smug smugly stacks his chips, and I take stock of what I've seen... this smug dude waited three rounds to play his first hand, and the hand he decides to play was worse than a 2-1 underdog to a freaking pair of sevens! On top of that, his clueless opponent decided that playing two sevens against a guy under the gun who had not played a single hand in 45 minutes. On top of that, Mr. Smug, having finally played a hand and only gotten a three card draw to call him decides it is best to now check his flush. On top of that, the clueless player decides to bet his three card draw after the one card draw in front of him checks. On top of that, clueless player decides to call a checkraise when Mr. Smug has an obvious monster. And finally, on top of all these fortuitous events combining for Mr. Smug... he still had less than a starting stack of chips! He won every hand he played, and he was losing. What a great game, for a skilled player. While Mr. Smug played like a rock, his choice of tight play was idiotic. At the same time, his opponent's loose play was similarly idiotic. In Lowball or Texas Hold'em, playing almost any reasonable starting hand offers you a fairly good chance to get lucky against an opponent who holds a hand that is also weak but somewhat better than yours. In Draw, it is harder odds-wise to come from behind and (because there are only two limit betting rounds) it is very hard to extract value from an opponent when you do come from behind, even if they play bad. Longterm lesson #1... never underestimate how poorly poker players play, especially players who smugly overvalue their own skill and approach to the game. Arrogant, confident players who play against the odds are even better opponents to face than bad/clueless opponents are. When at any tournament table, one of your first jobs should be to identify who is playing confidently when they have no reason to be so confident. These players should be your #1 target at the table (aside from specific individuals whose weaknesses you know well). Longterm lesson #2 comes from a situation I faced when we finally made it to the final table. I had been struggling all night, getting no really good hands, having to make due with stealing the antes and winning marginal one- or two-pair hands. But I do make the final table (paying eight), and so I am happy to be getting a payday with probably the second smallest stack. She wants no cards. I remember being dumbfounded. There had only been a handful of pat hands in the hours I'd been playing, and never two pat hands at the same time. But now look at my pat hand... 5432A is literally the worst pat hand there is. I can't beat any other legitimate pat hand. All full houses and flushes beat me. All straights are bigger than mine. All I can do is tie Barbara if she also has a wheel, which is extremely unlikely. But what the hell can I do about it? My hand is 5♣4♢3♠2♣A♡. There is a microscopic chance Barbara is standing pat on three of a kind or two pair, maybe hoping I might break 7♣6♣5♣4♣3♢ to draw to a straight flush, but that seems less than a 500-1 chance. There is also a microscopic chance she has overlooked her hand, like having four spades and a club. 1) stand pat behind her, hope she also has 5432A and hope for a split pot (or win if she has trips or two pair). 2) draw three cards to 5♣2♣. 3) draw four cards to A♡. 4) just say the hell with it and draw five cards. I decided to stand pat and hope I would tie. But Barbara had A♠K♠J♠7♠3♠, and I got my payout and went home: now tortured by wondering, from a Fundamental Theorem of Poker perspective... if I knew she had an Ace-high flush, what should I have done? If Barbara's had would have been a King-high flush, I would win about 510 times if drawing to my Ace, compared to 432 times drawing to my 5♣2♣, and 275 times drawing five. Since I can't assume she has an Ace, or any other card, drawing to the Ace would be the best draw, giving me something around 200-1 against straights/flushes and 690-1 against full houses that don't involve aces. When completely in the dark, if you draw to the nuts you always have a chance, in this case drawing to either the Ace or five cards, but only if you are sure your opponent isn't sneaky enough to stand pat on an incomplete hand! In any case, if you ever find yourself in a Draw High tournament, hope for any hand except a pat 5432A! Even a pat 65432 would have been less torture, since I could plausibly beat one hand, and wouldn't have an Ace to draw to.